This entry was posted in LHC News, Particle Physics and tagged atlas, cms, LHC, particle physics. Bookmark the permalink. will be looking forward to that next post, then. Yes. Do keep us updated. Any thoughts on this putative “fifth force”? Great to hear from you, Matt. Looking forward to more news from the LHC. Is that where you are working full-time now? Great to have Matt back on line. Matt where are you working now? Keenly interested in what you have to say when the data/results become available. As a side note, whenever you have time, could you explain what inverse pico- and femto-barns when they are used on the Y axis on plots such as this? I know the “barn” refers to the proverbial ‘side of the barn’ in physics, i.e., cross-sections. But what is meant by inverse of an area? Anyway, an unexpected light Higgs boson does that point to a cyclic universe? So close to an unstable vacuum is like we are just living on a pointed extremely heavy pencil balanced by an ever so small force. So, it won’t much change in force for the pencil to collapse. But we are still here and if everything is a wave, oscillations, this force will eventually be restored back and likely balance the pencil again, i.e. another big bang. I guess the question is, is the Higgs field variable or a very stable magnitude? Good to see back, the Trumpmania thing is just not cool. One thing I don’t understand about the increase in Luminosity is how much extra trouble there is from separate events that are simultaneous within the parameters of collection. (At the other end of the scale, there is the work on quark/gluon plasmas, which are intrinsically multiple events). An article about these aspects, and (eg) whether gating takes into account lightspeed re reaching the detectors in terms of its trigger slicing, or even whether decay chain interactions can be significant, would be really interesting. there could be actually upto 5 Higgs. Couldn’t the new bump be one of them. Excuse me for my stupid Q. The kinematics of Quantum reality : where the Mathematics lead us ? – the problem of Holism. Matt, I enjoy reading all your publications and the comments and questions posted. Please keep them coming. There’s the Fourth Annual Large Hadron Collider Physics Conference (LHCP2016) in Sweden starting this Monday and lasting for the week. I’d expect 1-2fb will have been analyzed in time to add to the tension; it would be too good an opportunity for the publicity machine at CERN not to milk. 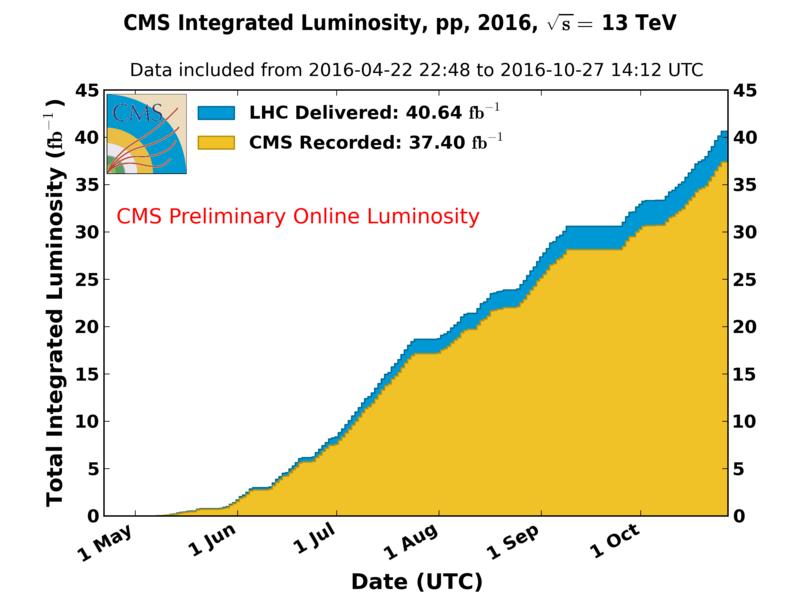 The LHC should add approx 1.5fb/week if there isn’t any more bad luck, giving 10fb by mid July.